At the end of January, the team at ESP Ltd Libya played host to a committee from the Arabian Gulf Oil Company (AGOCO). 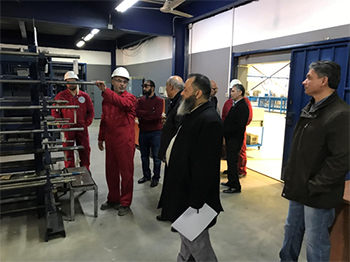 The AGOCO team, which included Messrs. Abdulqader Albusifi, Walid Aljaroushi and Yousef Al-Shaibani (pictured above), toured ESP Ltd’s recently refurbished base in Tripoli. The visit started with presentations from ESP Ltd’s operations manager, Ibrahim Entira, which covered QHSE and new technologies from Baker Hughes, a GE company (BHGE). ESP Ltd’s team also provided a detailed history about the group’s extensive artificial lift experience in Libya as well as the group’s long term commitment to the country. The AGOCO team was then taken on a tour of the base, visiting the 1200m2 ISO certified workshop as well as the warehouse and storage areas. This visit is an integral step in AGOCO’s approval process for ESP Ltd, who hope to support and work closely with AGOCO in the near future.